GREENVILLE, S.C. — Looking for a career with a bright future? Thanks to the recent surge in evil clown sightings, clown hunter is now one of the nation’s top 10 fastest growing occupations! Since August, the U.S. has been plagued by sightings of sinister clowns, some of whom try to lure children into the woods. Bewildered law enforcement officials have been unable to keep pace with the epidemic, and so communities have sought the help of hired guns, shelling out as much as $45,000 a pop to rid their town of a rubber-nose-wearing menace. But clown hunting is no barrel of laughs. Experts say it’s dangerous work that has already cost many overconfident wannabes their lives. NO LAUGHING MATTER: Evil clowns like Pennywise in Stephen King’s “It” are running amok across America. In many ways, clown hunting is more challenging than more traditional professions such as vampire hunting, demon hunting and witch hunting. That’s because there are many different types of evil clowns and each type must be battled with different techniques and weapons. 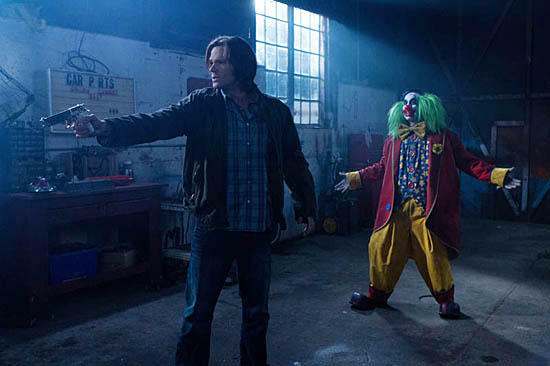 Among the weapons an experienced clown hunter takes into the field are a shotgun loaded with rock salt, silver throwing knives and a water pistol loaded with holy water. But more important than the right weapons is the right training. Familiarity with specialized fight moves such as the “eyeball poke block” and the “cream pie duck,” both inspired by the Three Stooges, is essential. In the past few months, two clown hunting academies have cropped up, one on the west coast, the other in Minnesota. Next year, several community colleges plan to offer certificate programs in clown hunting. Kencaid advise novices to apprentice under an experienced hunter for at least three months before taking on a solo gig. “If you go after a clown unprepared, the joke will be on you,” he warns. If this made you chuckle, check out the author’s collection of news satire, available on Kindle and in other eBook formats.